Big Tex: The Voice Of The Sate Fair Of Texas Gives A Shout Out To Noah! You are here: Home / Parenting / Big Tex: The Voice Of The Sate Fair Of Texas Gives A Shout Out To Noah! Please allow me to give you example #539 of how awesome / amazing / incredible the community that has formed through this site and our Facebook page is. I recently posted about our son’s first trip to the State Fair Of Texas and today, after coming home from what was shaping up to be a pretty lousy day, I find this incredibly epic video posted by one of our readers/friends smack dab on our Facebook page. How crazy is it that: a) this friend not only read my post about being such a fan of the Texas State Fair, but b) SHE LIVES NEXT DOOR TO BIG TEX HIMSELF…!!! Wow! This. Is. Epic. Meeting (well, sort of meeting) Big Tex is like a million times more epic than meeting Dog The Bounty Hunter or someone super famous like that. I’m sort of star-struck. And yes I said Icon. With a capital I. Big Tex is a living legend! And there he is. The voice of the Sate Fair of Texas giving our son a shout out. This is a very proud day indeed. 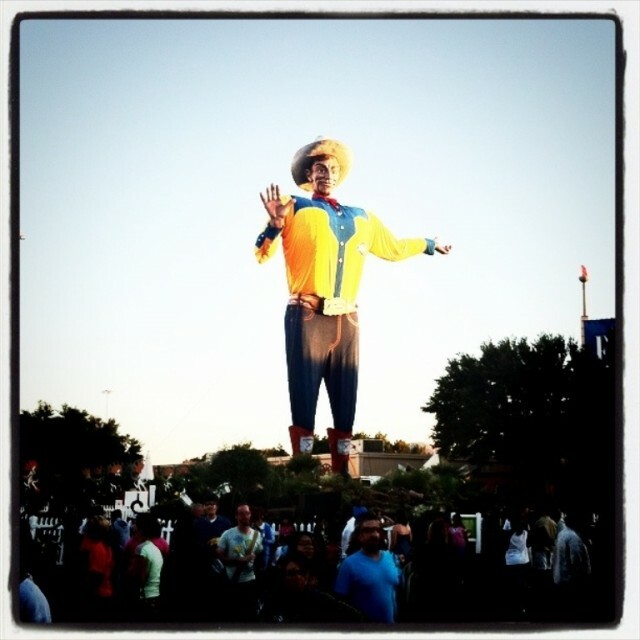 What do you guys thank about Big Tex? Wouldn’t you agree that he’s even cooler in real life? I know…! Big Tex is pretty awesome, huh? It is completely embarrassing that after living in Dallas for a decade, I’m a little star struck! Haha! That is amazing, and I absolutely adore the constant positivity that comes from your blog and Facebook! Hey thanks! I really appreciate the kind words. I live in Los Angeles now! Yep, I’m back! The week in Honduras was absolutely great. Got a lot accomplished, and learned a lot, too. Hoping to write up a blog post about it. I’ll let you know when I do that. Being back to see my boys was even better! We got in late, but James woke up and gave me the biggest grin ever! We used to live in Lewisville, TX. I attended the TX State Fair several times. I remember the first time I went, I thought “This isn’t like any fair I’ve ever seen!” I had only been to small county fairs, and this was a whole other world! I remember Big Tex well. Glad Abbie reined you in on Noah’s name as “BigTex’sDad.com” just doesnt have the same ring about it somehow!! thanks for taking the time to post even if after your lousy day!! hope today is an improvement! !